"We love this cabin and will return at least once a year"
Your very first morning will convince you that this is truly a wonderful vacation home, as you watch the rising sun come up over the misty mountains. You will truly find peace and relaxation while sipping a hot cup of coffee and reading a book while watch the sun move across the mountain peaks. The world’s pressures will float away making this your vacation destination of choice for years to come. The 3 bedroom suites include all-natural, full-body stone showers perfectly suited for this special vacation destination. Each of the three floors offer gathering areas that beckon conversation in front of cozy fireplaces or overlooking the great room. This vacation home is complete with an outdoor fireplace on a large deck inviting your and your friends to enjoy the rocking chairs with a cup of coffee or a cool glass of wine as the mist settles back in over the mountains…or have an old fashioned southern barbecue with friends or family members as the sun sets and bathes the area in shades of rose and violet. The private patio on the terrace level will entice you to relax in the hot tub or to just sit and chat while others enjoy. Make sure to go inside to the terrace level family room and sit next to a huge stone fireplace and hearth to be entertained with a movie on the Philips Ambilight 55-inch flat panel TV with an amazing state-of-the-art movie theater style surround sound system. During the cooler months of course, you'll have the fully equipped kitchen to prepare your favorite meals and a cozy dining area to enjoy them. Watch the game on the entry level TV, or just get lost daydreaming with perfect view of the mountains. Frankly, no expense has been spared in making this a destination you will want to return to again and again and no words can describe all the unique details of this luxurious cabin. It just has to be experienced. Sunrise Destination is above it all! Located in the prestigious private community of Mountain tops. The team members at Southern comfort were very helpful and made our stay even more enjoyable by giving us information about the area .very friendly staff! Best vacation for a family get-together in an amazing cabin lovely setting. We were charmed by the friendliness of the residents of Blue Ridge ! Everyone was very nice and friendly each time I called. They were more than willing to help with any changes or accommodations that needed to be made. We loved it! We've recommended this property to others already. We will definitely be coming back! All were helpful and knowledgeable. Very friendly, accommodating and professional. Great team. 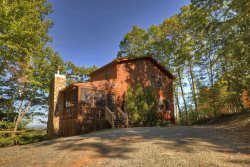 Walking distance to "Choctaw Mountain Lodge" and "Choctaw Ridge" or a short drive to "Babbling Brook"